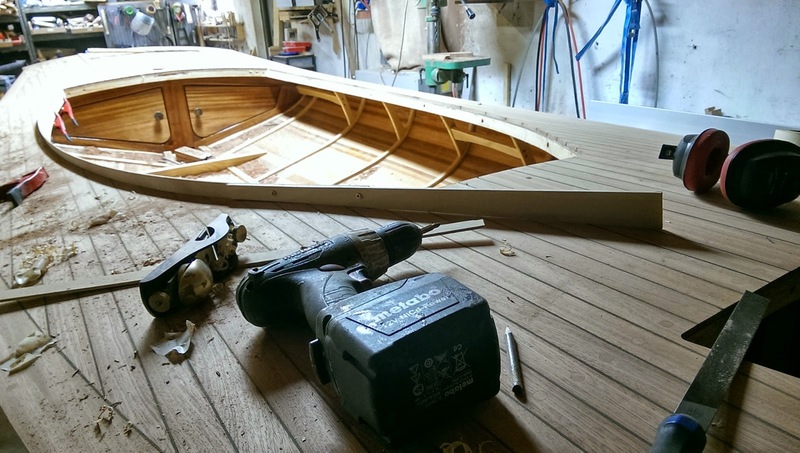 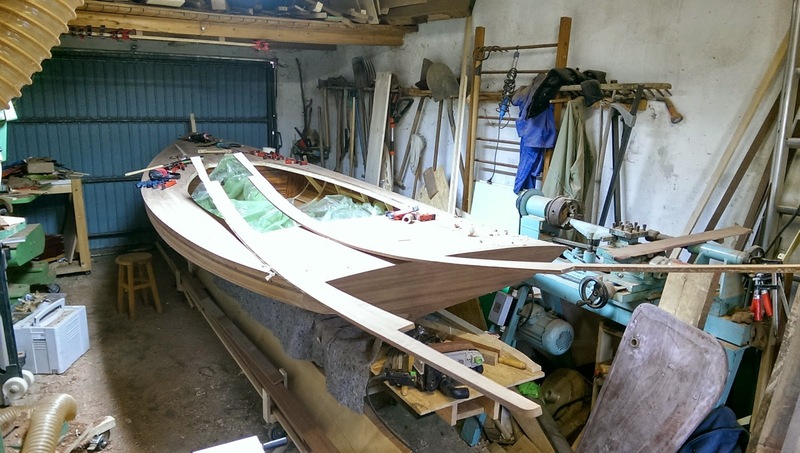 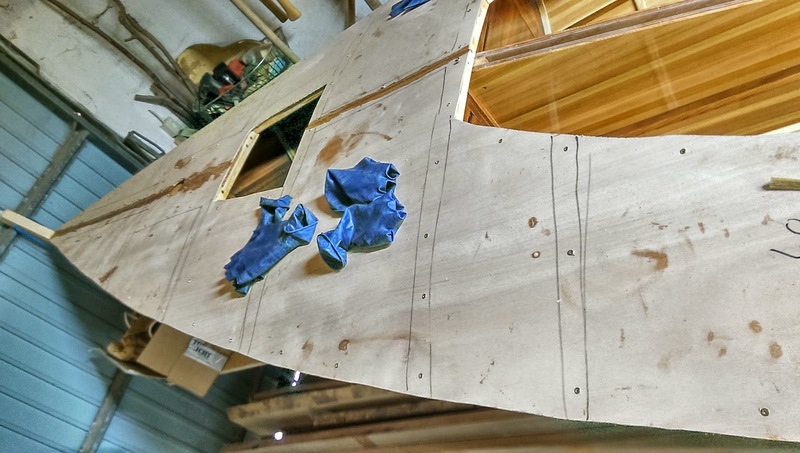 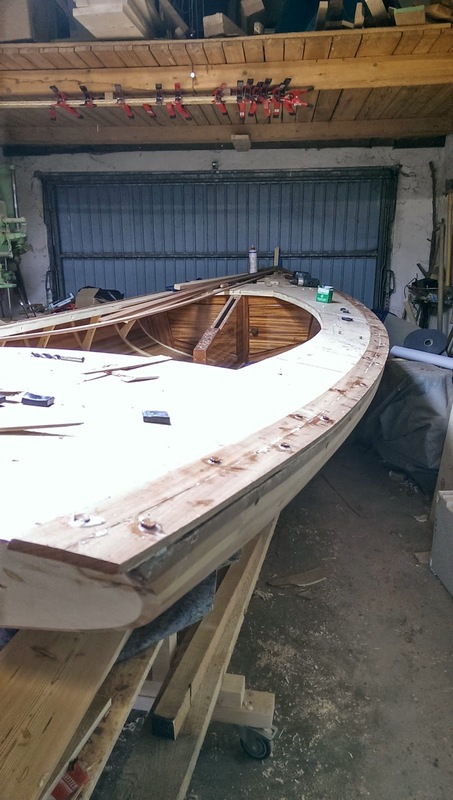 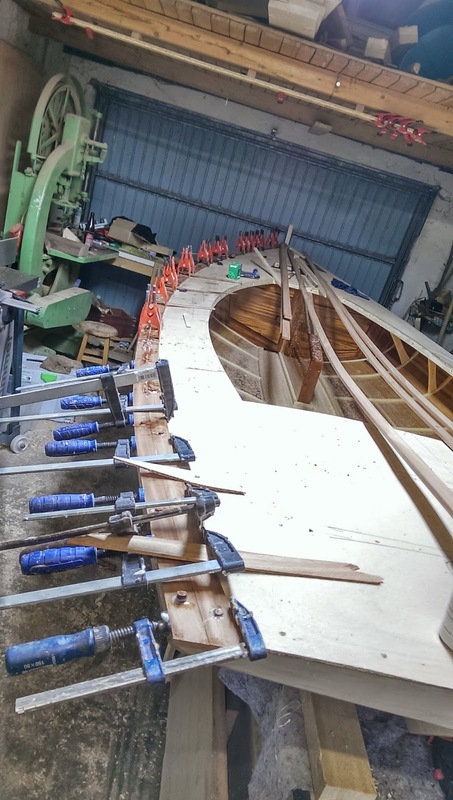 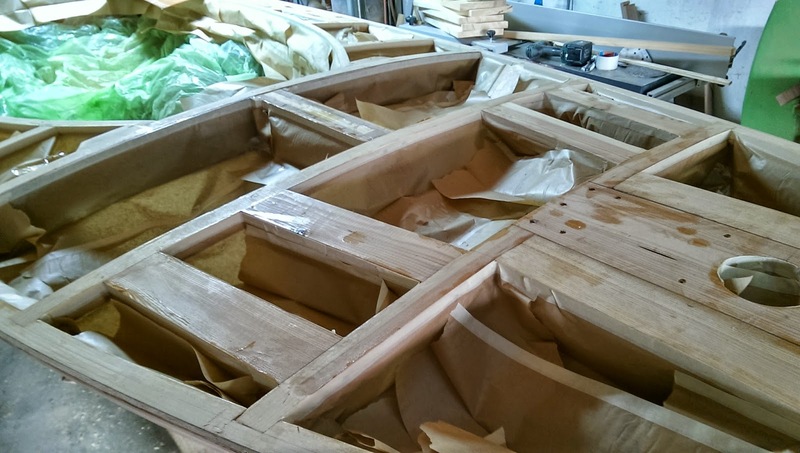 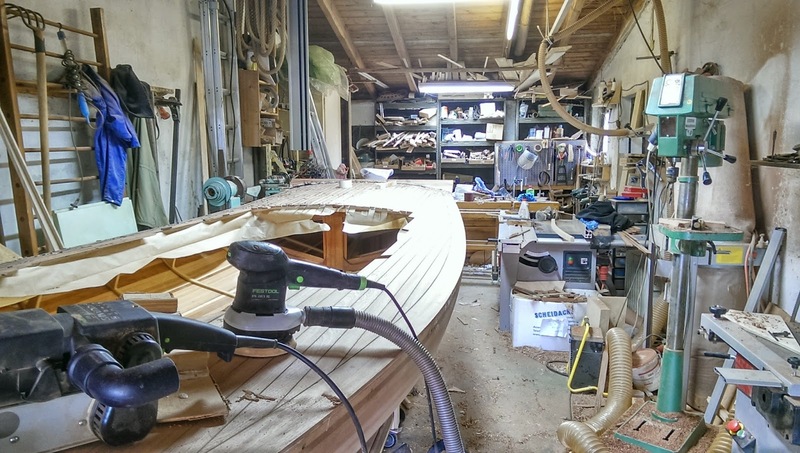 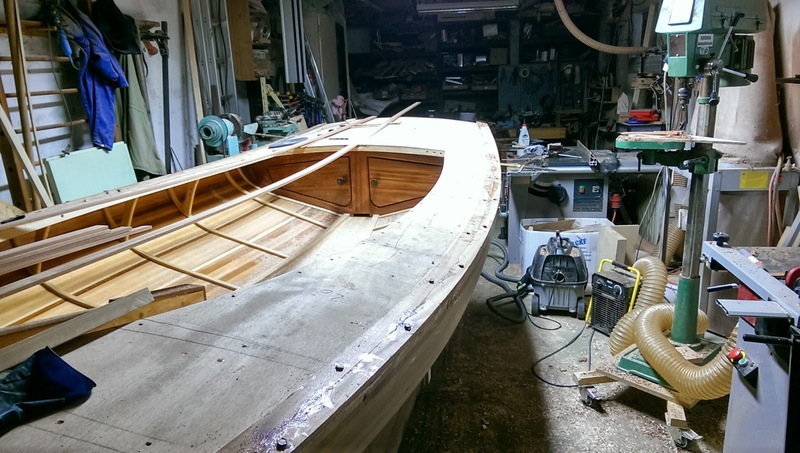 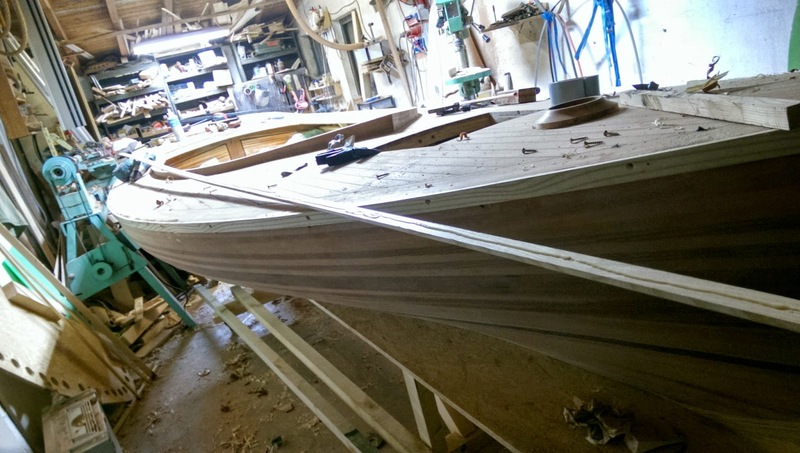 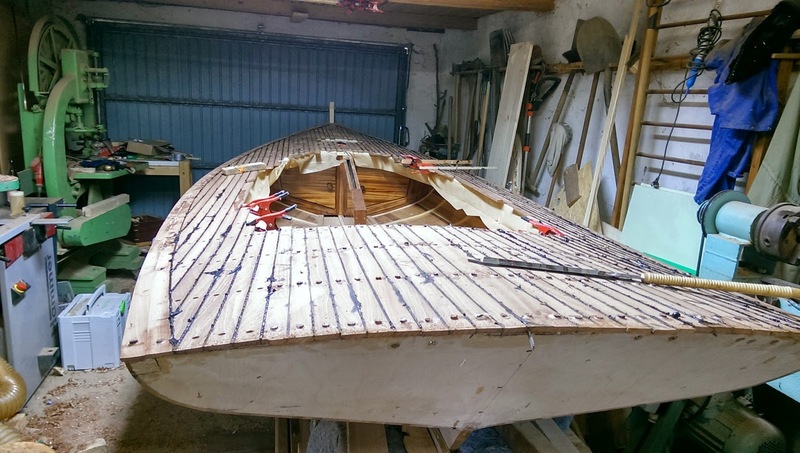 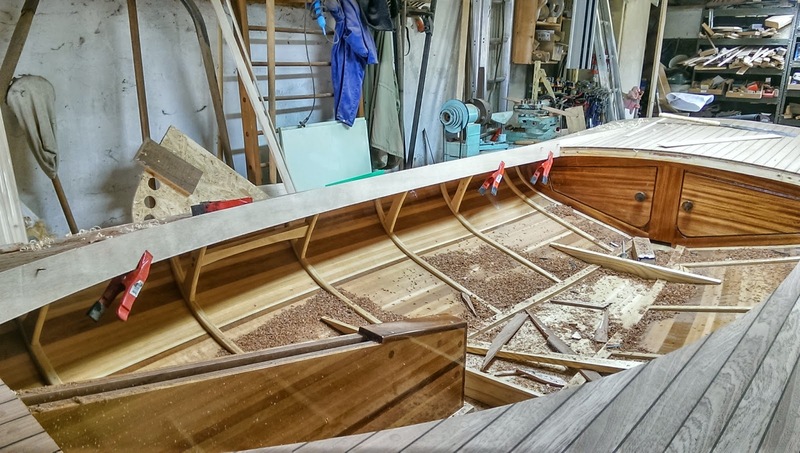 More parts are coming together, it is real fun to see the boat taking more and more of the final shape. 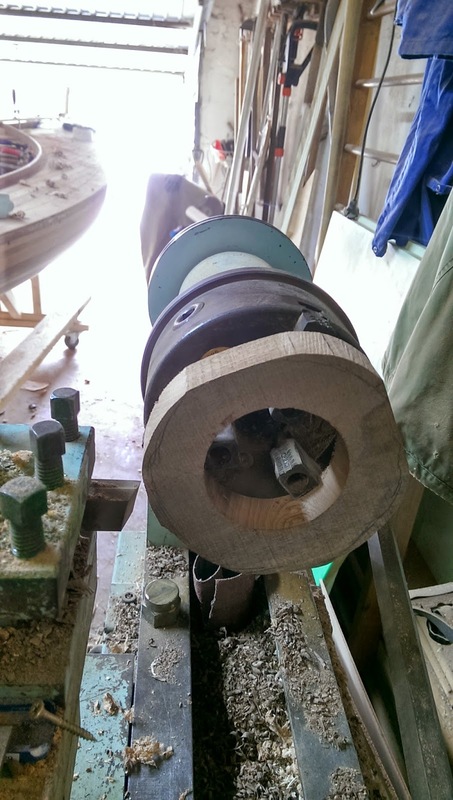 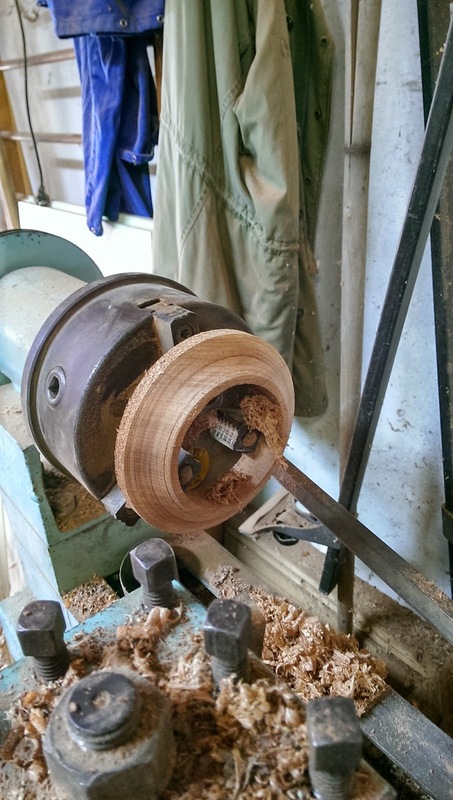 turning the cover for the mast partner on the lathe. 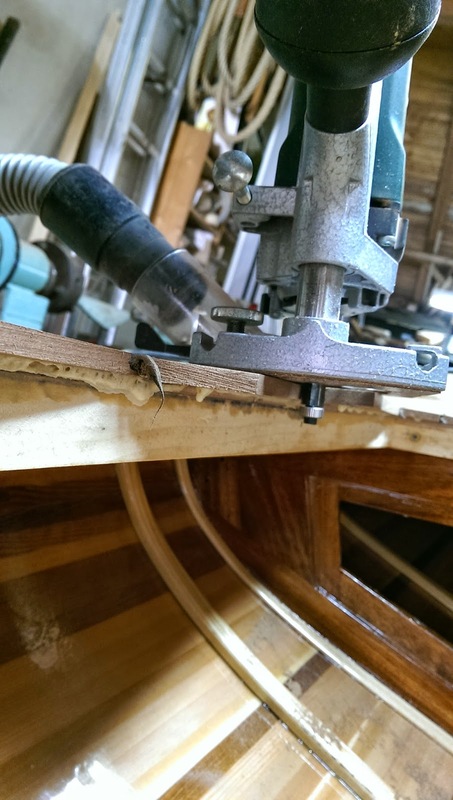 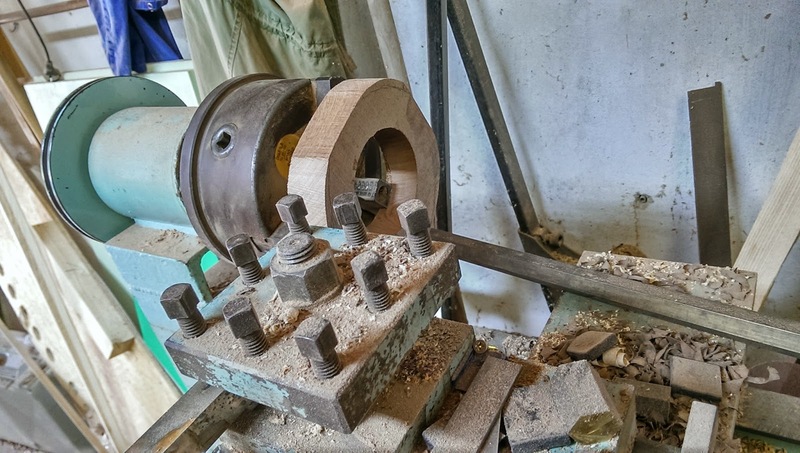 The hole was cut out with the same jig that was also used for the mast partner supporting structure, king plank, deck etc. 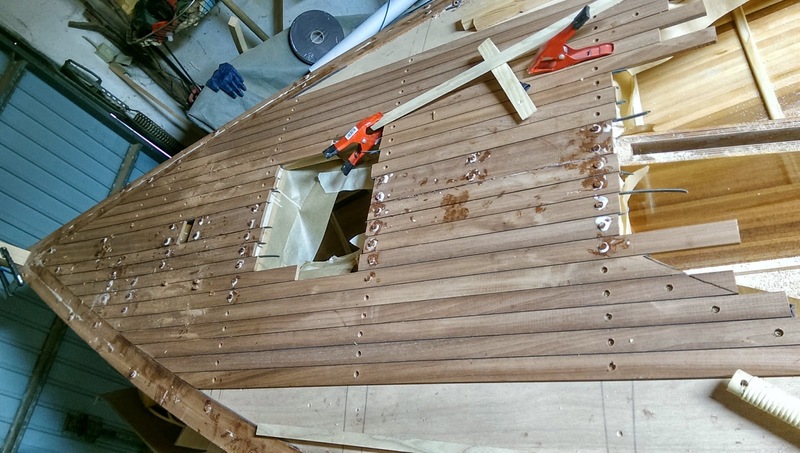 the whole idea was to attach a 7 cm wide plywood strip INSIDE the cockpit edges and then attach the protruding front and back flush with the deck with screws. 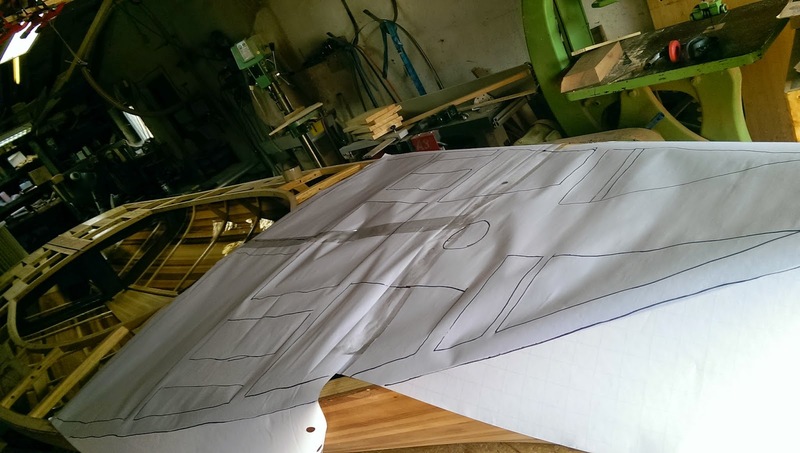 this gave the perfect template for cutting the real piece. 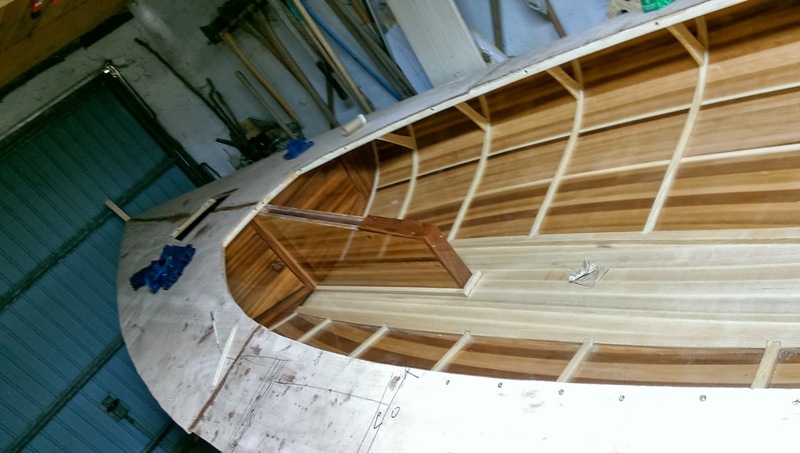 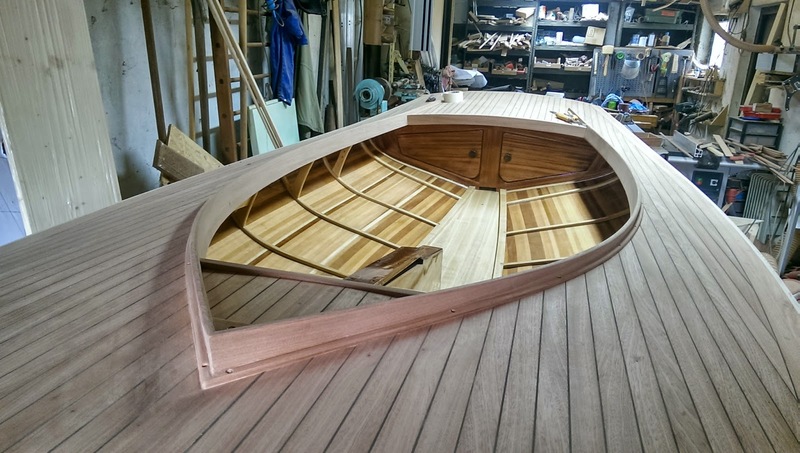 For each side I took 1x7 mm and 1x4 mm Mahogany, the 2 pieces were then bent-laminated in place, creating a 11 mm thick deck coaming. 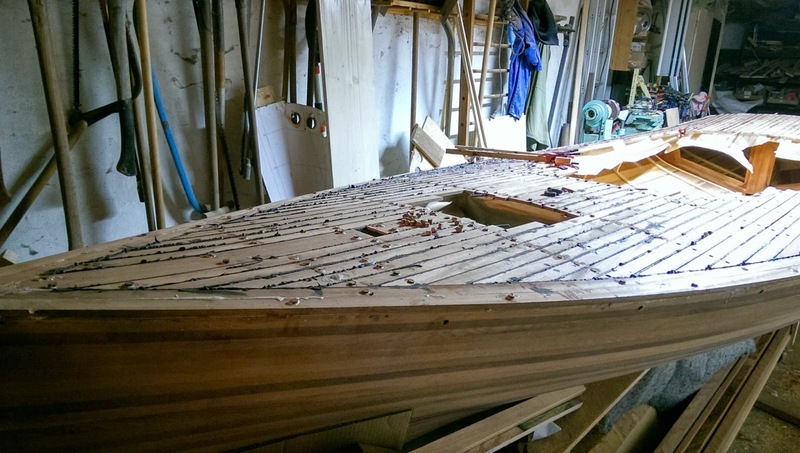 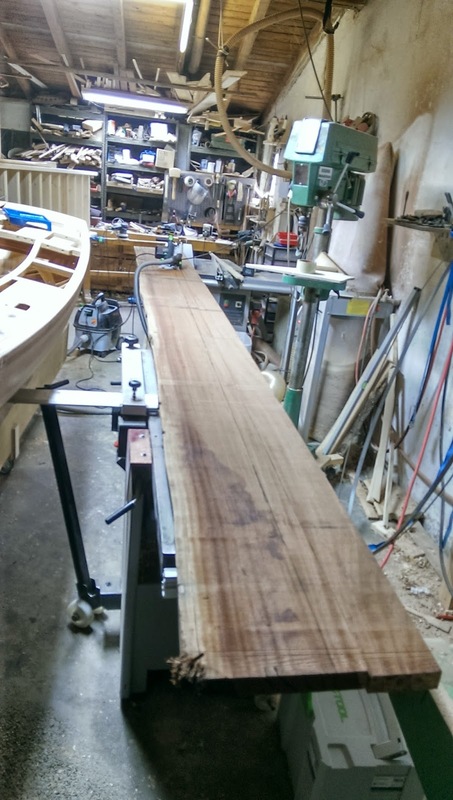 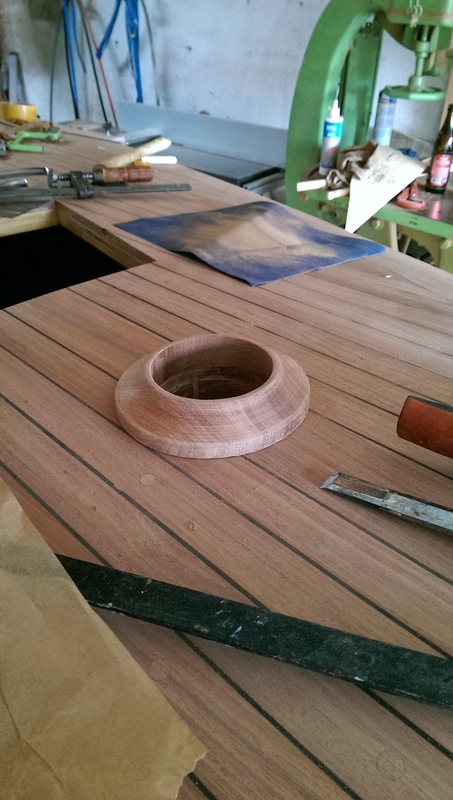 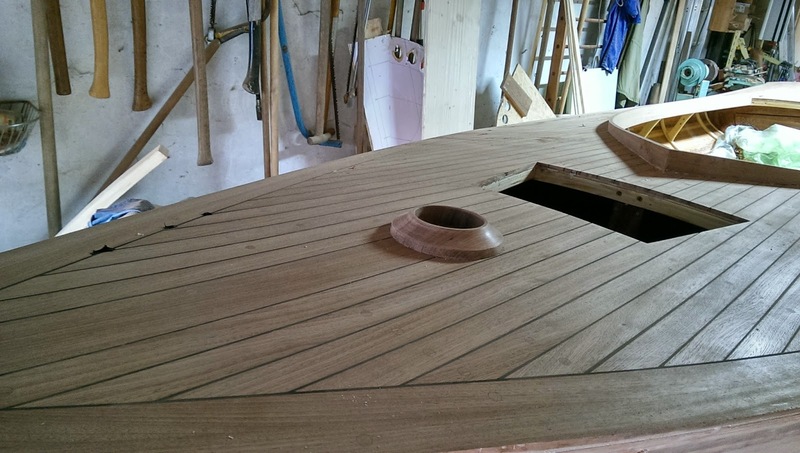 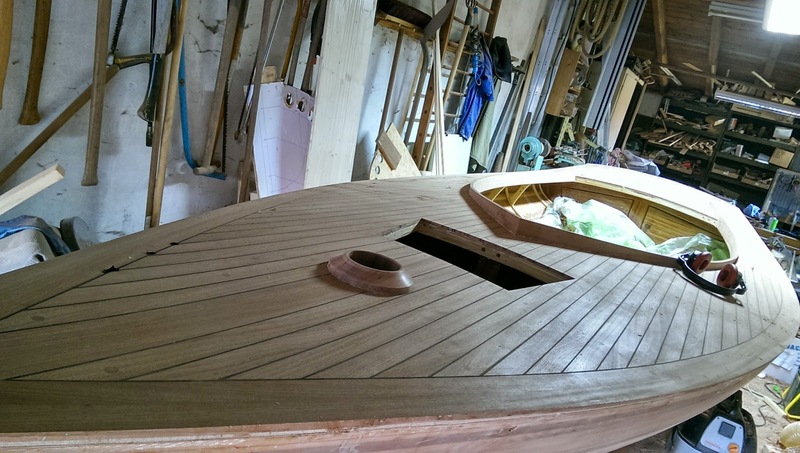 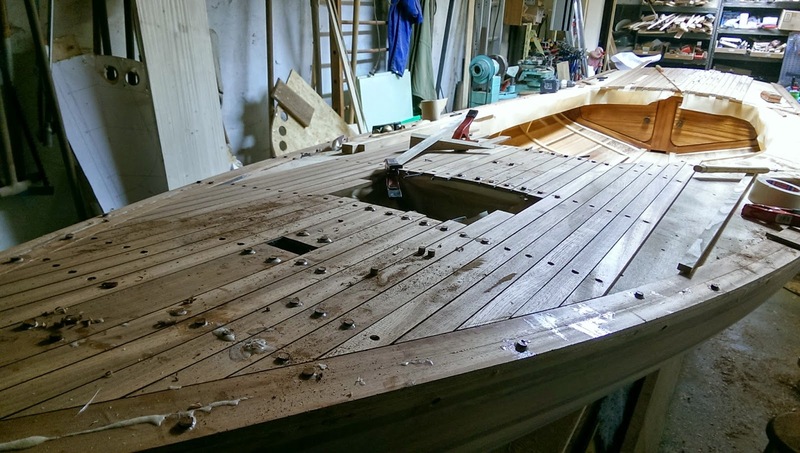 It`s getting serious now - the Mahogany deck. 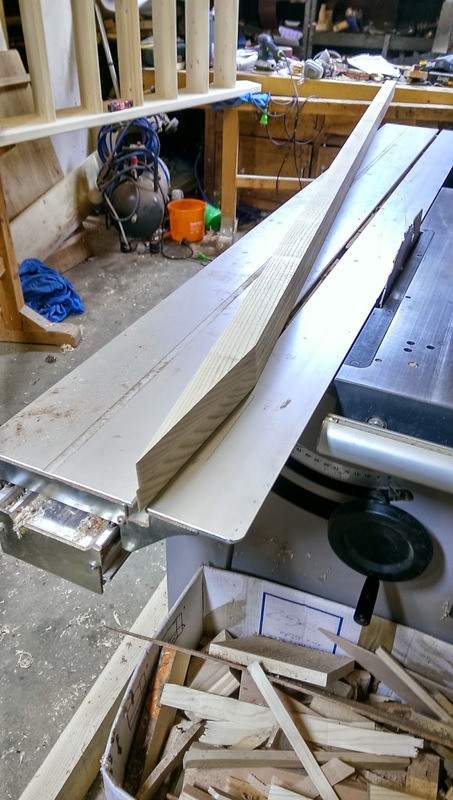 6 meter long, handling those guys saves plenty of money for the fitness club. 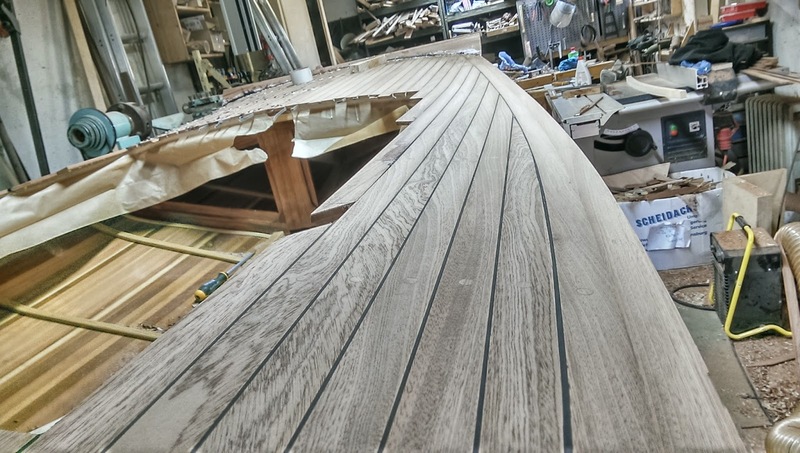 Creating the outer deck planks from 2 33 mm planks. 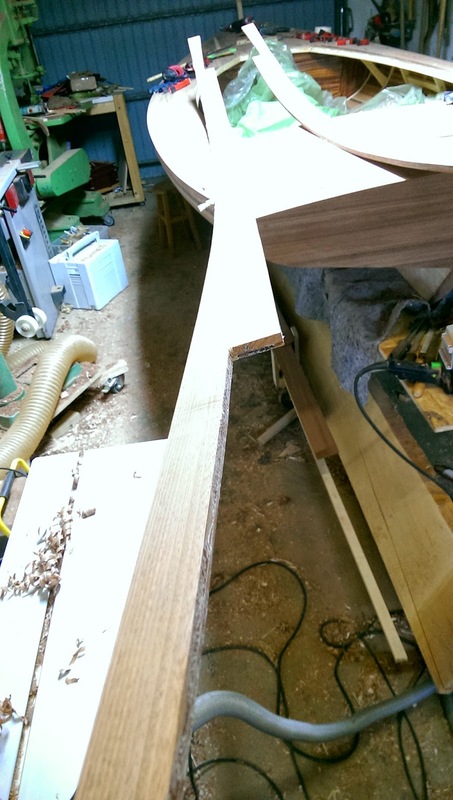 now the planking starts. 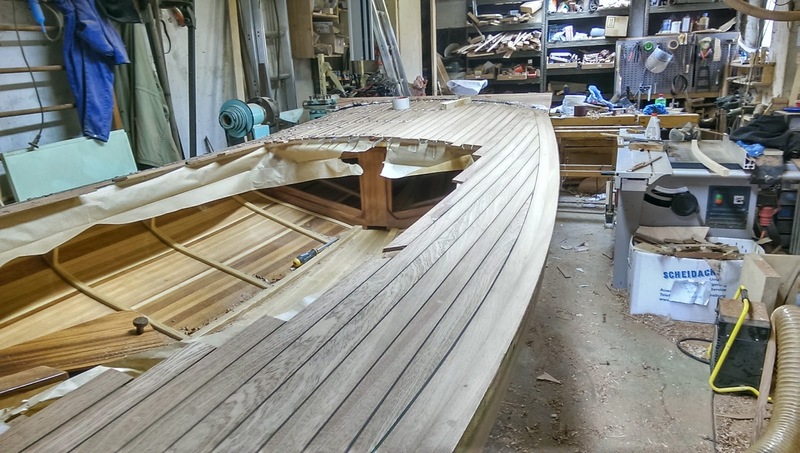 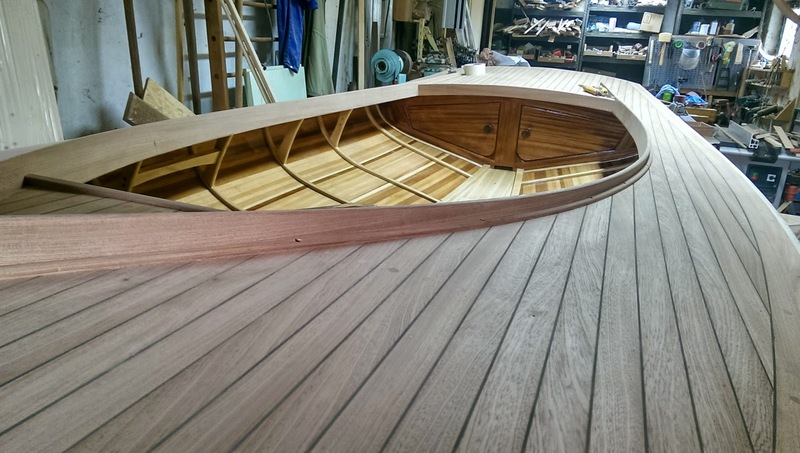 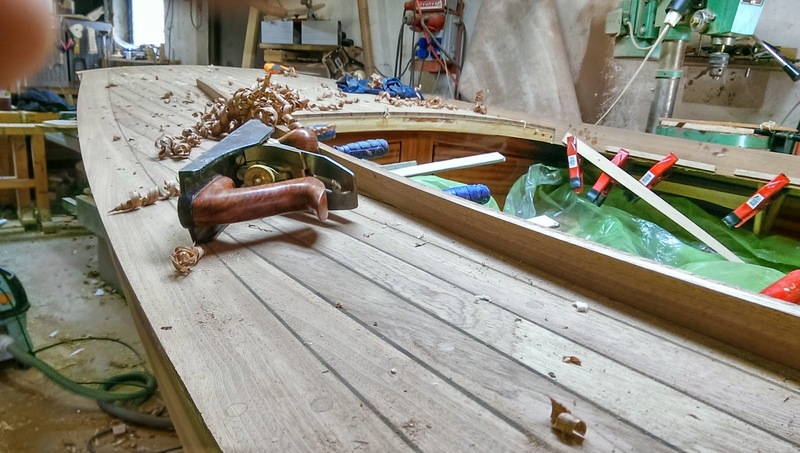 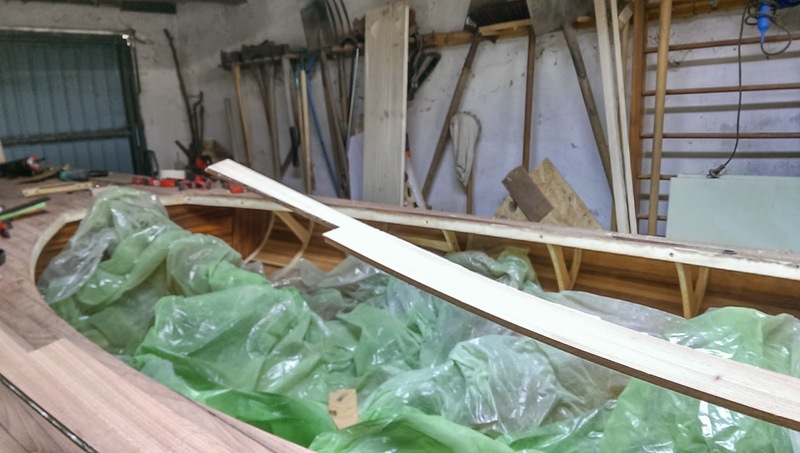 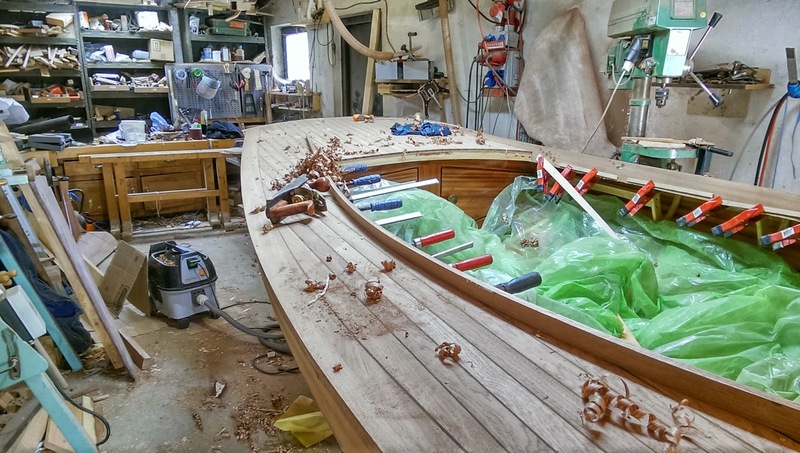 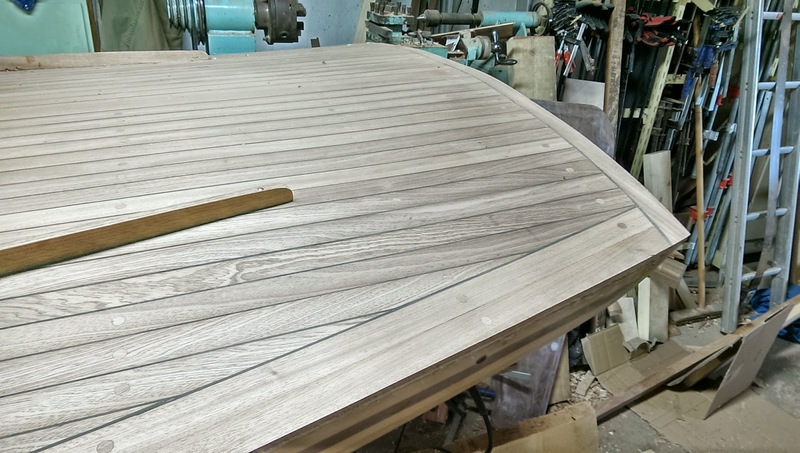 A lot of discussion went into the question of the planks should follow the outer curve of the deck (classic Yacht-deck) or just be straight. 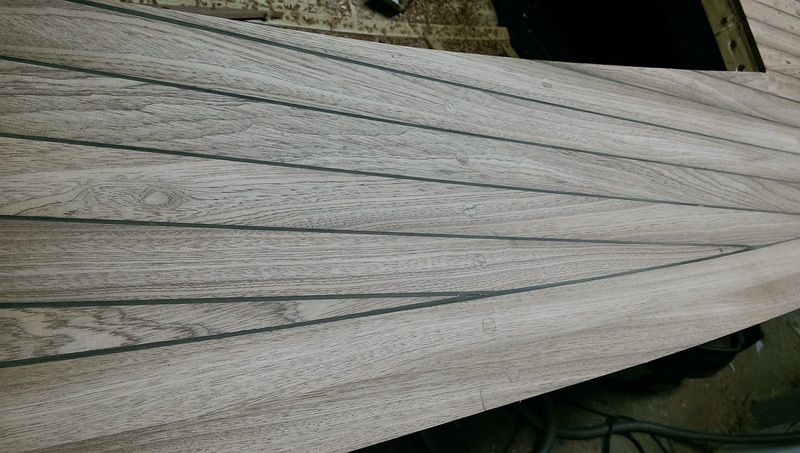 At the end the majority of the votes went for straight, which now I also think fits the period of the original Melonseed better. 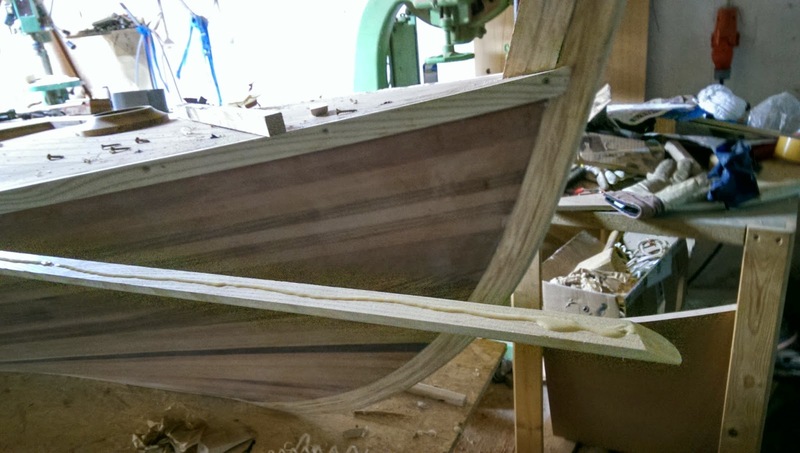 the sanding process was less bad than expected. 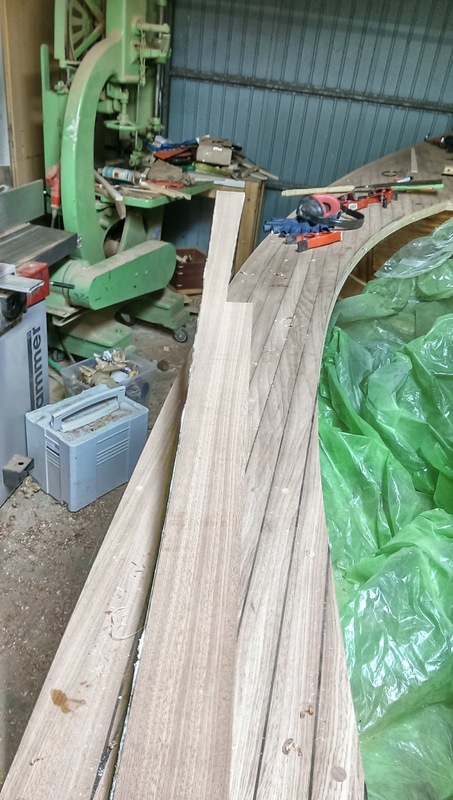 Not even a full day. 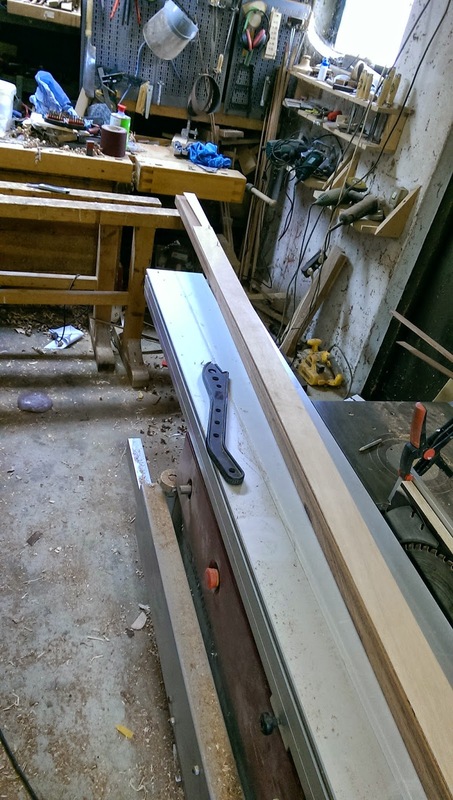 Turned out the best combination for me is belt sander with 8 grit to get a flat surface and take the Sikaflex off. 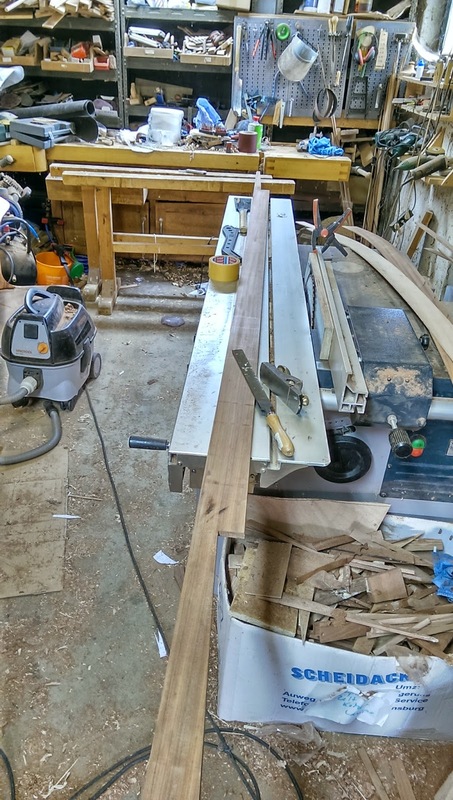 Just need to make sure to NEVER stay in one place with the belt sander. 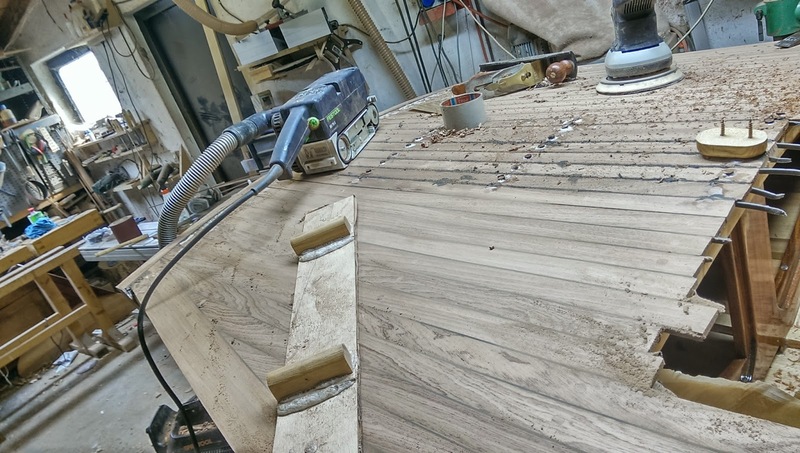 The belt sander activity was followed-up with a lot of very healthy manual sanding / leveling with a longboard with 100 grit sandpaper. 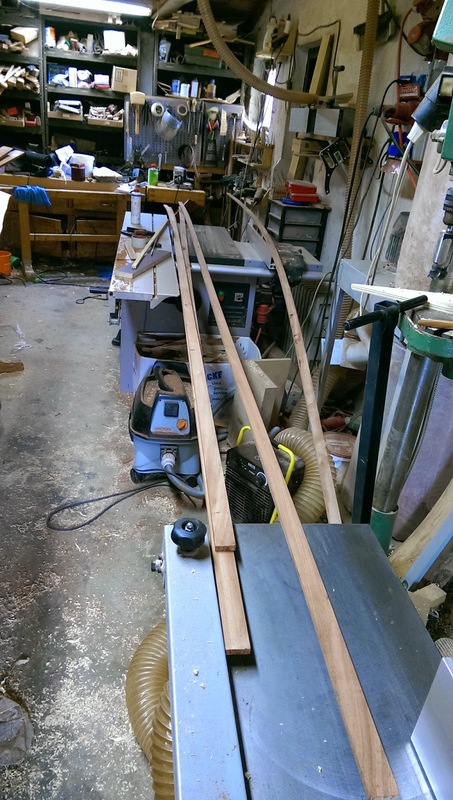 self-made long board in place. 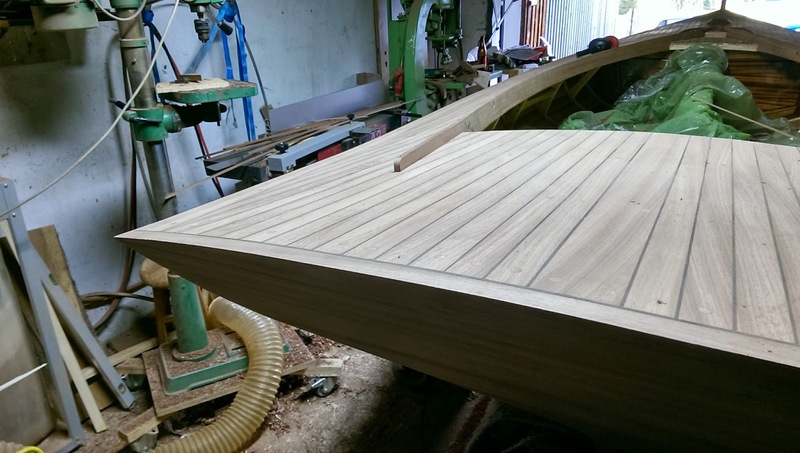 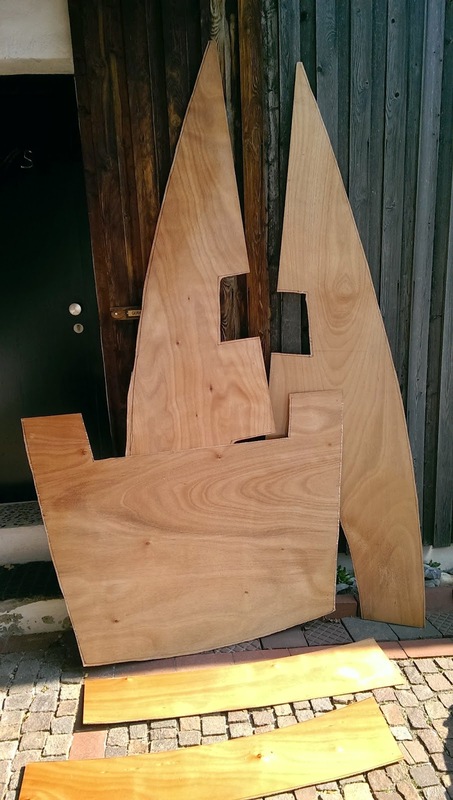 Time for the deck - the first layer is made out of 4 mm marine-grade Okume plywood. 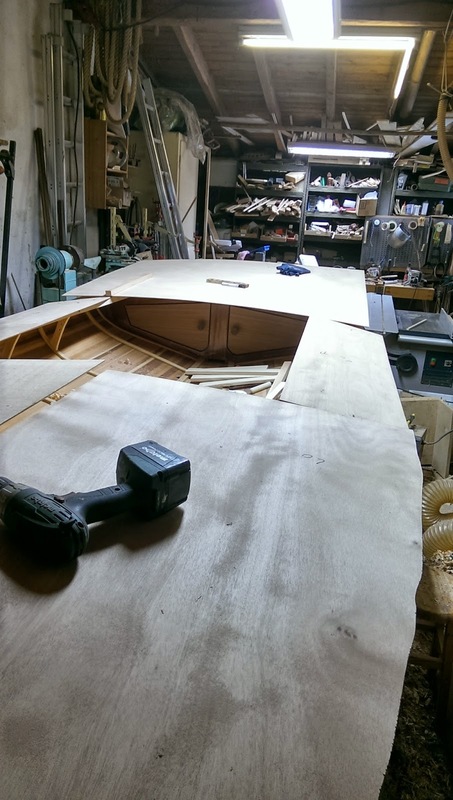 This will later be covered with Mahogany planks. 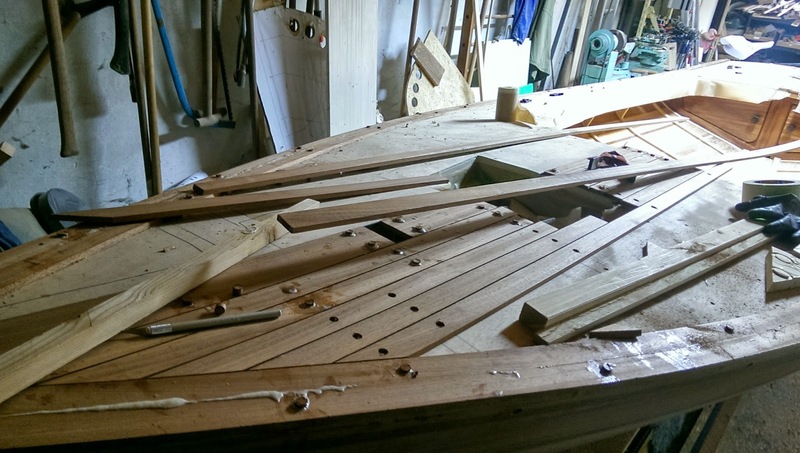 i thought it be a good idea to take the layout of the supporting deck structure to have a "plan"" for future mounting of deck fittings etc. 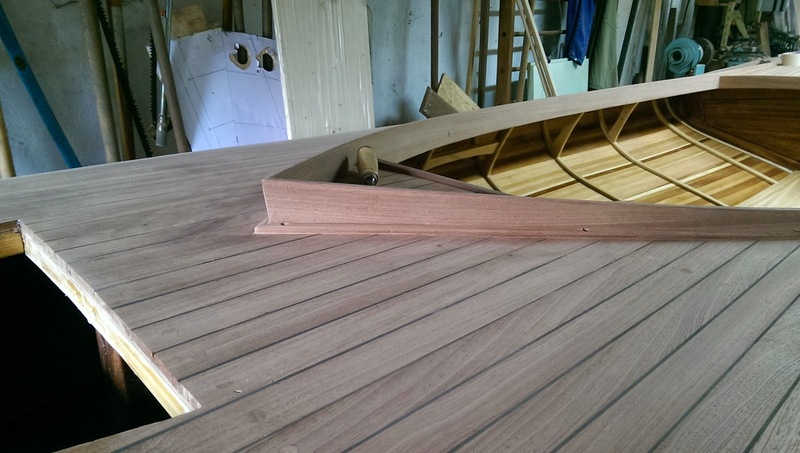 I simply used screws to keep the deck in place while the thickened epoxy cures. 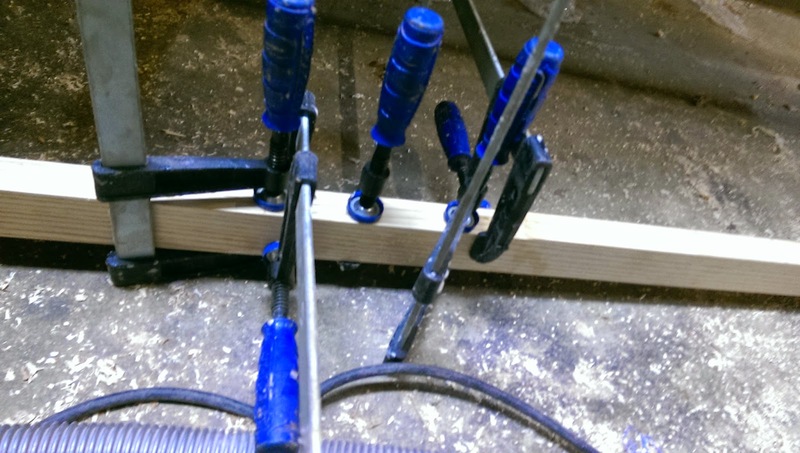 The screws were removed afterwards. 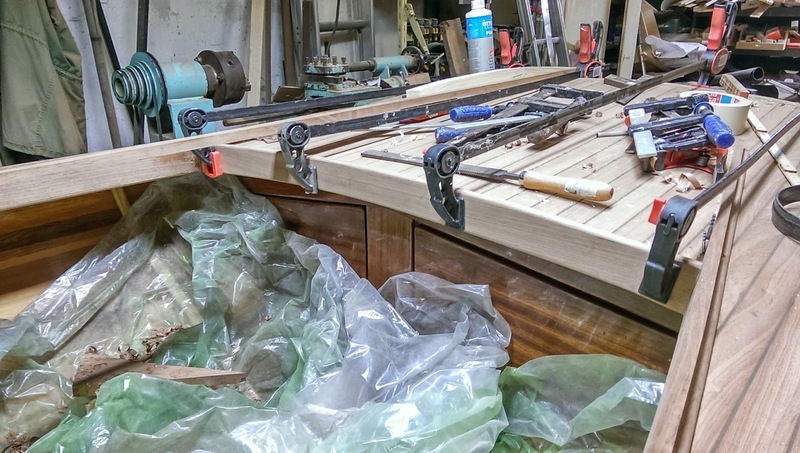 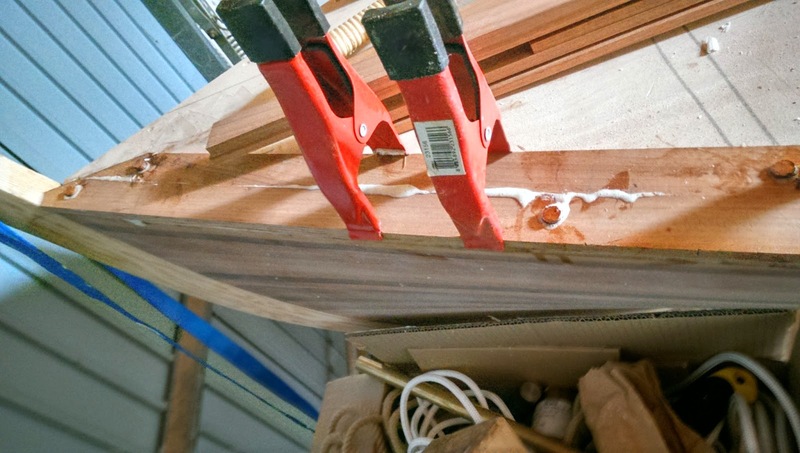 I found this the most efficient way to keep the deck in place while ensuring a tight fit on all gluing surfaces. 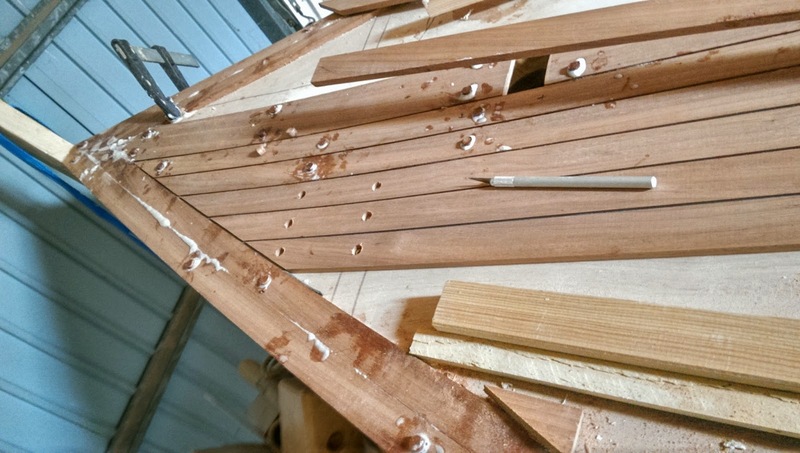 The screw holes dont play a role at all as they will be covered with the top layer anyway.